Avalon is the place where dreams are made of and love blooms all throughout the year! We are the largest privately owned year-round garden venue in the Brazos County and would love to share Avalon’s beauty with you. …Over 25,000 square feet of wildflowers that bloom throughout the spring and summer, and 50,000 square feet of Texas Bluebonnets, plus 125 blooming crepe myrtles and 350+ rose bushes along old-world inspired stone pathways and masonry. There is no closing time or curfew during your rental period! …You are welcome to use any vendor for your event! …We can photograph your wedding (Darrin is a Master Photographer!). We have several package levels to fit your personality and style. $3000- Rental of the facility from Friday until noon on Sunday. Rental includes tables and chairs for up to 200 people. 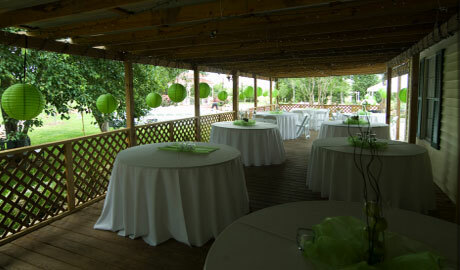 We have 20+ 60″ round tables, and plenty of 6′ rectangle tables for food, cake, gift table, DJ, etc. $4000- Same as above, plus Master Photographer, Darrin Hill photographs your Wedding. All images are burned to a CD with high resolution images, or we can supply them on a USB drive. All images come with a copyright release so you can print them wherever you wish. All images are edited for color and density. Darrin has been photographing weddings for over 30 years, and will happily photograph any wedding, even if its not at Avalon. $1500- Photographs of the entire wedding, all burned to a CD or USB drive. Normally Darrin starts about 2 hours before a wedding and ends when the wedding ends. Engagements and Bridals can be added to any photography package for an additional $500 . All images burned to disk or USB drive. All images are carefully edited for color and density. Leather bound, full page wedding, custom albums can also be added to any package. Pricing starts at $1000. Inquire for details. We are by appointment only for visiting Avalon. We are available after 3 p.m. during the day, evenings and on weekends…whenever is convenient for you. Please call Darrin and Rebecca at 979-778-0698. Darrin’s cell phone at 979-229-7311, Rebecca’s cell phone at 979-229-9949 or email us to set up a showing. If you have any other questions, please let us know. Come see why the largest privately owned, year-round garden venue in Brazos County is the place dreams are made of! Experience the Heart of Avalon! The main Gazebo is encircled with 10 varieties of vibrant roses. Just 50 ft. away from the Gazebo is our Main Building with a wrap around covered porch. Famous for its flowers that bloom nearly year-round, Avalon bursts with color every spring with large wildflower fields that include bluebonnets. With close to four acres of landscaped scenery surrounding Avalon, anywhere on the grounds offers impressive views and backdrops.